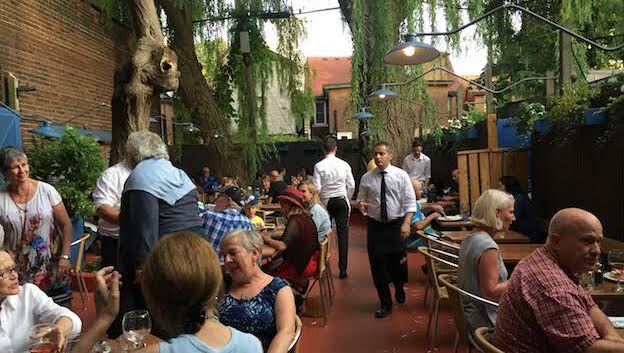 For hearty food with flavorful twists, and interesting sweet-sour and boozy nuances (for example, mango-jalapeno salsa and Whiskey-based sauces), plus one of the best all-Canadian wine lists Toronto and Canada have to offer, run, don’t walk, over to Allen’s. Grilled and barbeque food don’t get much better than this, and eating outside in the patio on warm spring or summer days makes a lunch or dinner that more enjoyable. 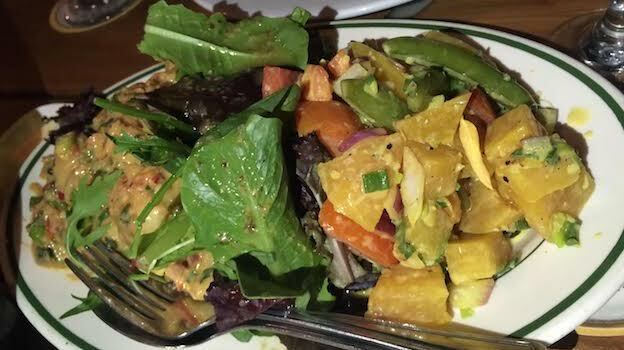 It helps that owner John Maxwell is extremely knowledgeable about wine in general, and that he goes out of his way to source high quality ingredients and meats. His menu will tell you the meat served at Allen’s (be it chicken, beef, or lamb) is from animals raised hormone-and antibiotic-free, and fed mixed grains, and/or hay, grass, squash, cabbage and celery silage. The Caesar salad with shaved Parmigiano Reggiano was large, fresh and creamy, though I would have liked more anchovy bite; still, it was a great way to start the meal. The meat at Allen’s is simply out standing. 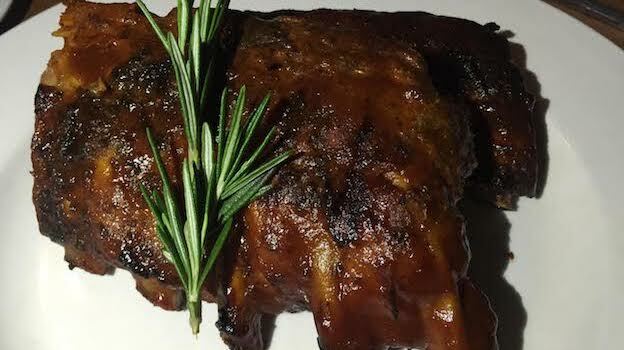 I enjoyed the breast of heritage duck with Dijon mustard cream sauce just as much as I did the ‘Thrill of the grill’ award inning barbeque pork back ribs with Cajun spice rub and Wild Turkey Bourbon sauce. The rib eye steak with Jameson Whiskey sauce was almost too big for one person, while the lamb chops with peppercorn sauce were plump, pink and juicy. The back ribs were also extremely tasty and lifted by just the right amount of smokiness. 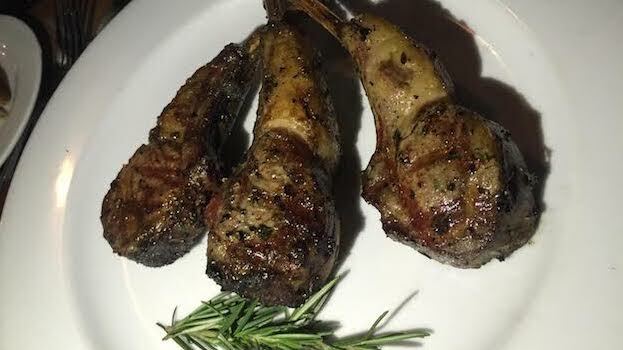 Clearly, this food isn’t meant to be especially intellectual, but it’s not often that you come across such well-cooked grilled meats, so bravo! to Allen’s. My meal was enhanced by a bunch of great New World wines from Canada, Oregon and South Africa. A smashingly good start to the evening was provided by the two Pearce Predhomme wines, made by two friends who source grapes and make the wines at custom crush facilities or at other wineries. 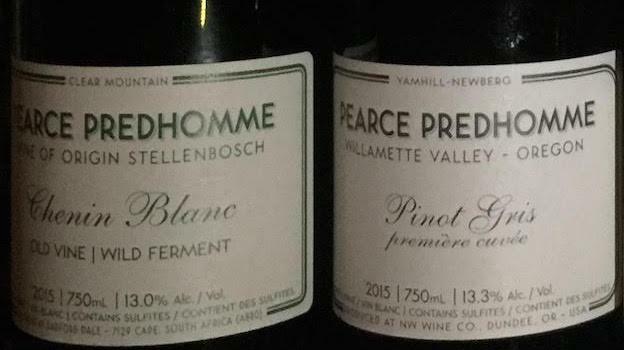 The 2015 Pearce Predhomme Chenin Blanc Old Vine Wild Ferment Stellenbosch is a case in point: bottled at Radford Dale, it is a textbook example of just how well this Loire variety performs in South Africa. The wine was one of the night’s stars, showcasing pretty lemony and beeswax nuances of noteworthy concentration and complexity, with a creamy but lively lanolin mouthfeel. The 2015 Pearce Predhomme Pinot Gris Première Cuvée Yamhill Newberg Willamette Valley is another in a long lineup of delightful Oregon Pinot Gris wines I have tasted over the years. The apple, pear and a hint of mineral flavors could have used a bit more concentration and complexity, but this easygoing, lovely wine won’t have any trouble finding plenty of admirers. The 2007 Charles Baker Picone Vineyard Riesling Vinemount Ridge is one of the best Niagara Rieslings of that rather hot vintage, but the cooler Vinemount Ridge designated viticultural area always allows for refined Rieslings even in hotter than usual conditions. This archetypal Niagara Riesling had just a hint of residual sugar (for example compared to the 2008 Picone Vineyard Riesling, which tasted drier) but is luscious and pure, with hints of flinty, ripe orchard fruit complicated by jasmine and sweet spice nuances. William Predhomme of Pearce Predhomme is also involved with the North Shore Project, though my understanding is that the latter is currently on hold, as one of the original partners has started up his own sparkling wine estate out in Ontario’s Prince Edward County. The two wines I tried during this meal were both highly enjoyable and easy to drink, and so clearly, I hope the project takes off again. 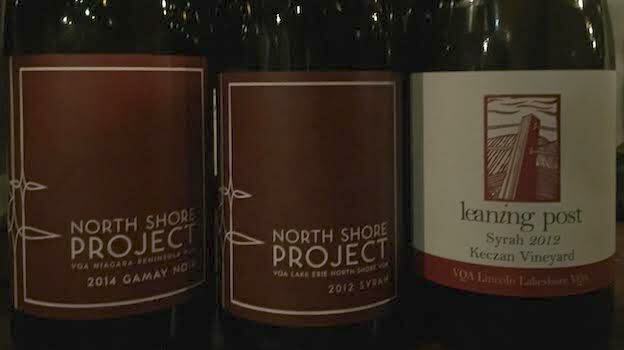 The 2014 North Shore Project Gamay Noir Niagara Peninsula shows just how well this variety does in Ontario, offering brambly red fruit and peppery aromas and flavors that were refreshing and bright. Not surprisingly, it proved a superb pairing with my back ribs. 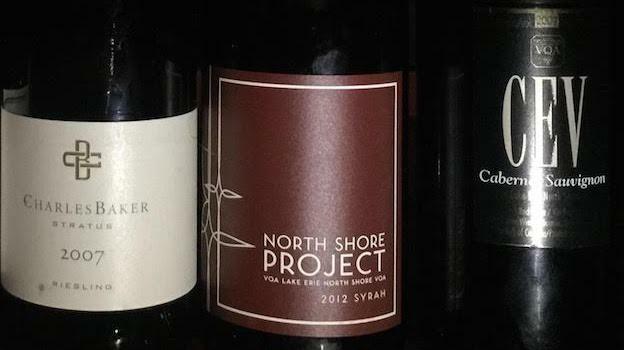 The 2012 North Shore Project Syrah Lake Erie North Shore was a real surprise, as I can’t say I have had that many truly memorable Syrahs from Ontario, but this one ticks all the boxes. One sip, and the violet, red fruit, and delicately smoky nuances brought me immediately back to Côte Rotie. I especially liked the bright long finish, redolent of green peppercorns, hints of raisins and rose petals, and finely knitted tannins. Unfortunately, the vines have a hard time surviving the Lake Erie North Shore’s often brutal winters that wiped out a large portion of the vinifera vines planted there. My hope is that growers will keep insisting with what is a promising viticultural zone. The 2012 Leaning Post Syrah Keczan Vineyard Lincoln Lakeshore offered perfumed violet and black pepper aromas on the very aromatic nose, following through on the palate with good acidity and noteworthy refinement of small red fruit and sweet spice elements. This wine highlights Leaning Post’s knack for producing refined, flavorful wines that are never blockbusters but often seem blessed with sneaky concentration. The 2007 Colio Cabernet Sauvignon Lake Erie North Shore is aging extremely well, and offered lovely smoky dark small berries aromas and flavors. Cabernet Sauvignon is not the right variety for Ontario where it’s just too cold for the variety to ripen fully most vintages; however, this well made supple, very approachable wine with no green streaks matched perfectly with my grilled meat dishes and proved a very pleasant surprise from what is one of Ontario’s more underrated estates.